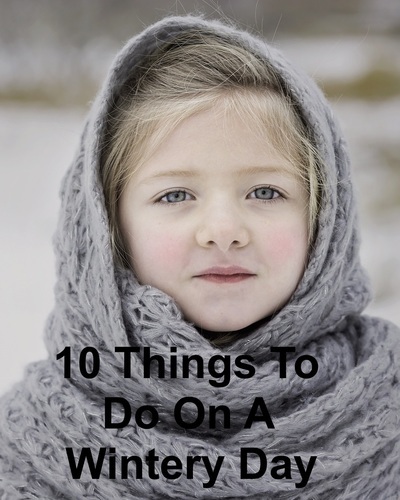 Whether you are a fan of winter or not, surely you must agree some activities are better done when the weather is cold. I mean, do you fancy a long soak in a hot bubble bath in the middle of summer? Does baking bread excite you when the temperature is in the high thirties? Some activities are just made for a wintery day. Note-if you have a heart condition or are pregnant have a warm bath rather than a hot one. A hot bath relaxes you and helps reduce anxiety. The steam can dry out mucus which may accumulate in the throat causing coughing. The steam is also good for your skin. A bubble bath can make you feel pampered and relaxed. The warmth of the oven and the smell of a cake or bread baking are great for lifting the spirits. There is something very nurturing about the smell of home baked goods. The smell makes the house feel warmer and welcoming. Yes, it is cold outside but put on a thick coat, your gloves and a beanie and go for a brisk walk. Your dog doesn't care that it's cold outside. Exercise during cold weather uses up more calories than the same exercise on a warm day. I love walking by the river on a winter's day. The sound of the frogs croaking and water tumbling over rocks lifts my spirits. Then when I return home I really enjoy a hot drink. These are cosy activities for a cold day. I don't do either of these activities but I know people who really enjoy creating things from wool. They are relaxing activities. The repetitive nature of knitting is calming and triggers the release of serotonin. Knitting distracts the mind from thoughts that have been causing stress. Find a comfortable spot, whether it be a chair, couch or bed and cuddle into a fluffy rug. Read a book while you sip a hot beverage. A cold day is a great time to snuggle up with your furry pet. Watching TV or Netflix is optional. I find it easier to get stuck into a session of decluttering on a cold day than when the mercury is soaring. The feeling of satisfaction afterwards is great. Click here for tips on decluttering. If you have surplus prints in a shoebox, a wintery day is a good time to sort through them. Put duplicates into a basket and leave it out where friends and family will see it. Let them take any photos they want. Decide on what date you will discard any unwanted snaps, you don't want them hanging around forever. Sit yourself down at your computer or laptop or get out a notebook and pencil. Write a poem or a short story. Write a letter, either on the computer or by hand. Some people really appreciate a letter, and think snail mail is special. There are plenty of things to do on a wintery day. Some are relaxing and nurturing and others will give you a sense of achievement.